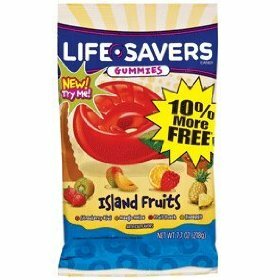 I think I have been craving tropical-flavored sweets all this week simply because graduate school applications are starting to be due; whenever I am stressed, I usually return to the sorts of candy that bring me back to a state of tranquility. And if you canâ€™t go to Hawaii to relax, you can at least enjoy its flavors. 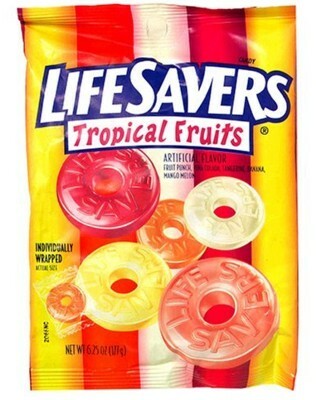 Tropical LifeSavers have been a staple of my tropical obsession since I was in elementary school. 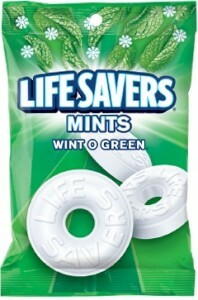 I never cared much for the other flavors of Lifesavers, but these were different. 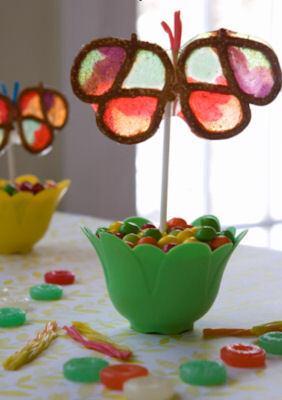 They sported an assortment of flavors that were nuanced for the candy world at age six because for the most part they avoided the clichÃ©d strawberry, cherry, etcâ€¦. For a long time my official “car candy” was Altoids. I liked the regular flavor, but my husband preferred wintergreen, so we kept two tins on hand (but his disappeared first, since his habit was to crunch through several Altoids at a time!). Oh, but I digress. 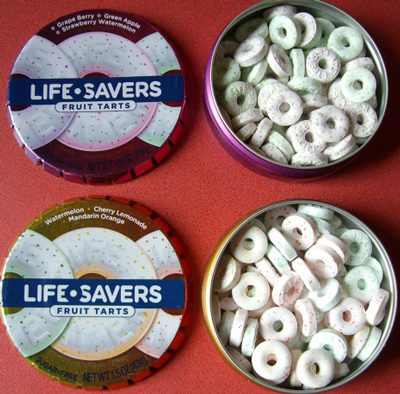 My current car candy is the tart and lovely Life Savers Fruit Tarts. These come in two varieties: the purple tin contains Grape Berry, Green Apple, and Strawberry Watermelon; the gold tin has Watermelon, Cherry Lemonade, and Mandarin Orange. I usually alternate between the two tins. The little fruit tarts are sugar-free but not, according to the tin, a “low-calorie food”. Whatever. The tin is very clever and cute. You press down in the center of the lid, and the sides release and pop open. The close, you replace the lid and just pinch the sides, and they snap back into place. Should I confess that I could not for the life of me figure out how to get these tins open? My husband had to show me. In my defense, though, these are car candies, which means I was too busy driving to read the instructions.